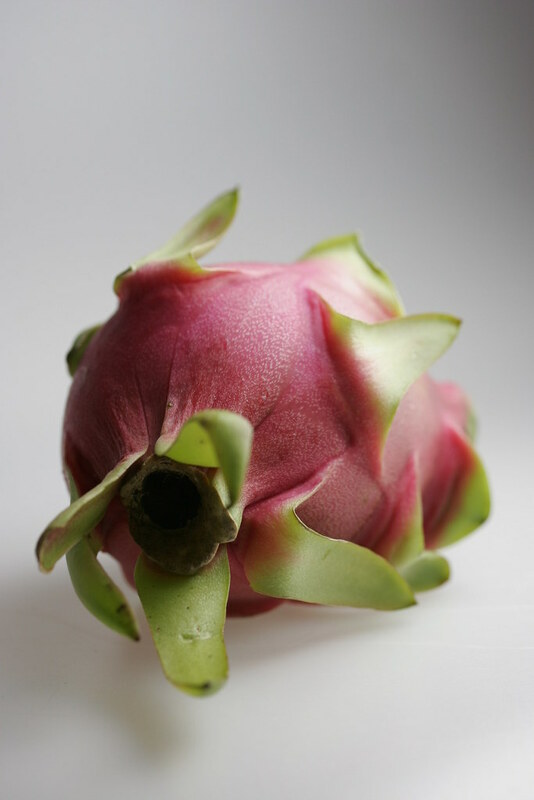 Since the day i saw this fruit in China town in NYC, i was just very curious about this fruit and i am trying & testing different recipes that i can use this fruit in various ethnic cooking & pastry production. The fruit is juicy, with a subtle fruity flavors. Red Pitaya is pleasant to eat and when sliced the fruit is especially attractive.The fruit is popular eaten chilled, out of hand. It is also used to flavor drinks and pastries. Unopened flower buds are cooked and eaten as vegetables. 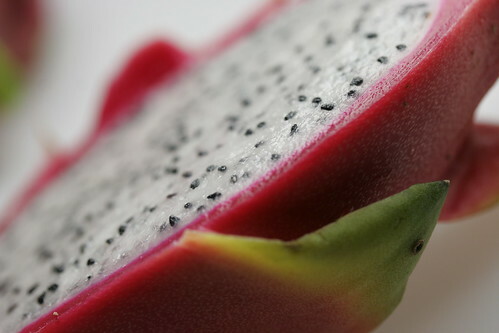 The exact origin of this dragon fruit is unknown, but is likely from Southern Mexico through Belize, Guatemala, El Salvador and Costa Rica. It is cultivated around the world in tropical regions. Native to Mexico and Central and South America, these vine-like cacti are also cultivated in Southeast Asian countries such as Vietnam, the Philippines, and Malaysia. They are also found in Taiwan, Israel, and southern China. This fruit only blooms at night; they are large white flowers that are often called Moon flower or Queen of the Night. 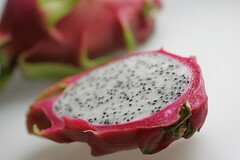 Combine dragon fruit, vinegar, sugars, onion, raisins, apples, garlic, ginger root, cinnamon, mustard seed, cayenne pepper, cloves, allspice, pepper and salt in a large stainless steel or enamel saucepan. Bring to a boil, stirring constantly to prevent scorching. Boil gently, stirring occasionally, 20 to 25 minutes or until mixture is thick. A good recipe for canning & preserving. Arrange all ingredients in shallow lettuce-lined salad bowl. Serve with lemon ginger dressing. Makes 3 to 4 servings. Lemon ginger dressing: Combine 2 tablespoons each oil, vinegar and lemon juice. 1 tablespoon honey, 1 teaspoon grated ginger, 1/2 teaspoon salt and 1/8 teaspoon pepper. love your website lots of interstingcooking going on . now i hope you can help me with same ideas with dragon friut ,as i want to use dragon friut with pan fryed fish . here in new zealand we use a lot of snapper,john dory,warehou. am thinking of useing rice & makeing a salsa of same form with the dragon frint . i would very much appreciate your help & ideas on this kind of friut . As a vegetarian I wouldn’t eat shrimp, but the combination of radishes, pomegranate and pitahaya has me intrigued, especially since I happen to have the latter two. Also, lemon and ginger seems like something that would work well with pitahaya alone, too. There is no one single formula or a recipe for a south Indian recipe. Probably there are as many sambar powders as there are south indians..
Fun recipe!! Mom loved it!!! © 2007 Chef Hari Nayak. All Rights Reserved.